We our delighted to introduce our new holiday property, Caseys Cottage, which is situated in the old fishermans' town of Brixham, near to the harbour. 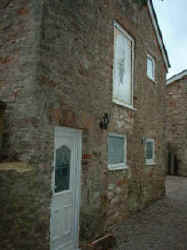 This old stone detached cottage was formerly used by the fishermen of Brixham to make and repair their fishing nets. It has now been transformed into a charming 2 bed roomed cottage, keeping in with its old character. The cottage is situated within a 2 minute walk to the cliff edge, where you can sit and gaze at the outstanding views, look to the left and you will see the whole of Torbay and then look to the right and you will see the extensive views of Berry Head with its rugged coastline, which is also worth a visit or just while away the time watching one of the largest fishing fleets coming and going. This view can be seen around the corner from the cottage. The harbour and town centre are approximately 5 minutes walk away. Once there you can visit the ship made famous by Sir Francis Drake (The Golden Hind), which you can actually board and look around the galleys etc. to see how the sailors of the past lived. Also close by is the statue of William of Orange. In the town and around the harbour you will find a huge assortment of shops and eating places offering everything from fish and chips to a full a-la-carte menu. You can see the pilot boats going in and out of the harbour to meet the larger ships coming and going to Plymouth, whatever you decide you will be amazed at the amount of activity that takes place around the harbour. Taking in the marinas of both Brixham and Torquay you will see the beautiful yachts that are moored there. 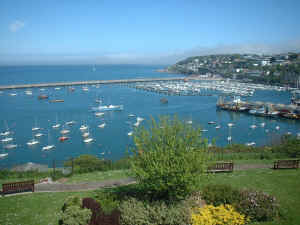 Brixham also boasts the lovely Shoalestone Beach with its sea water pool. This is about a 10-15 minute walk from the cottage. We can highly recommend this as a very nice place to be. You can sit around the pool and watch the children play. There is also a shop, a fish & chip bar and a park, which overlooks the pool. As this is a rocky beach, we would also recommend Goodrington Sands, which is the nearest sandy beach. It is a long, gently shelving beach, so it is ideal for young children. It is around a 10 minute drive (allowing for traffic). You can also visit Paignton, which is a little bit further along the coast. If you fancy going for a walk you will find some of the loveliest coastal walks from which you will see the outstanding beauty of the area. Nearby you can get to some of the nicest beaches all flying the blue flag. In the summer try a ferry ride, which runs from Brixham to Torquay (well recommended). There are bars on most of the ferries. And for the younger visitor there are a range of nightclubs and bars in nearby Torquay and Paignton. Visit our latest attraction Living Coasts our sea world centre. Whatever the weather you will find plenty to do for both adults and children. Visit the Spanish Barn on Torre Abbey Meadows in Torquay. In the Spanish Civil war up to 1500 prisoners were held there. Kitchen and Living Area: Fully fitted with modern kitchen appliances, including fridge, freezer, washing machine, microwave and breakfast bar with beautiful wooden floors, doors and skirting boards and mouldings. 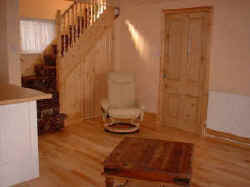 Living Area: Wooden floors and fittings as above, patio doors and a large screen TV with freeview, DVD and video. 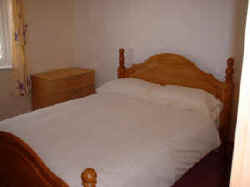 Bedroom 1: Double bedroom with double pine bed, fitted wardrobes and plenty of drawer space. Fully fitted carpet. Bedroom 2: Bunk beds, fitted wardrobes with TV and DVD. 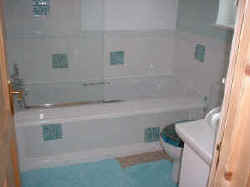 Bathroom: Luxurious with full size bath, shower, toilet and a vanity unit with large mirror and shaver point with inset lights to the ceiling. Linen can be provided if requested for an additional charge of å®¦nbsp; If bringing your own, please note that the double bed is normal size (not king or queen size). Guests should armani exchange replica bring their own bath towels, but a hand towel and tea towel is provided. Heating replica panerai radiomir watches and electricity are charged via meters situated in the cottage. The nearest railway station is Paignton (10 minutes away). Brixham is served by a very good bus service. Torquay centre is about a 20-25 minute drive from Brixham. A parking space in a nearby car park can be pre-booked, if required. Otherwise, parking is available in nearby roads. 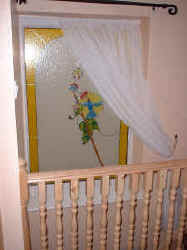 A cot and highchair can be provided if requested (there is room for the travel cot in the double room). Changeover day at this cottage is flexible. A security bond of à ©s charged, which is fully refunded after your holiday providing of course, that the cottage is left clean and that there are no breakages. Sorry no dogs. No smoking, although smoking is permitted in the enclosed courtyard. You can check availability for our other cottages by clicking here: Availability or prices by clicking here: Prices. Alternatively, check Late Availability to check for last minute cancellations. We also have included some suggestions for places to visit in the area on our Children, Out and About and Beaches pages. Comfortable, clean, non smoking establishment, very near all amenities for town centre, rail and bus stations. Beautiful lake-side Country Inn B&B in the heart of the Vermont Green Mountains. Perfect for group events and family groups in any season. Acres of lakeside meadow with barn and farm animals surrounded by beautiful scenery. The most complete source of checked and inspected riding holidays, horseback vacations and trail rides across the world. Including India's Most Travel Destinations, We Are Best Travel Agency In India and Presenting Affordable Tour Packages, Ayurveda, Spiritual, Luxury and Heritage Tours In India.